[2017.02.01] Prof. Peter B Luh was awarded "the IEEE RAS 2017 George Saridis Leadership Award"
[2016.01.29] Associate Prof. Li Xia was awarded "the 2015 IEEE TAC Outstanding Reviewer"
[2013.10.05] Special Issue "Advances in Simulation Optimization and its Applications" turns out to be one of the three most popular articles of the journal in 2013. [2013.6.20] Prof. Qianchuan Zhao is inviated to serve as an associate editor for "IEEE Transactions on Control of Network Systems"
[2013.5.15] Yin Zhao and Qianchuan Zhao's paper was nominated one of the finalists for the Best Automation Paper Award in IEEE ICRA 2013. Prof. Peter B Luh was awarded "the IEEE RAS 2017 George Saridis Leadership Award". The IEEE Robotics & Automation Society (RAS) recognizes and congratulates individuals for their outstanding accomplishments and service to RAS and the robotics and automation community. The IEEE RAS 2017 George Saridis Leadership Award is awarded to Prof. Peter B Luh from University of Connecticut, "for his exceptional vision and leadership in strengthening and promoting the field of automation science and engineering". The awardee will be honored during an award luncheon to be held at the IEEE International Conference on Robotics & Automation (ICRA 2017) on 1 June at the Sands Expo and Convention Centre, Singapore. Associate Prof. Li Xia was awarded "the 2015 IEEE TAC Outstanding Reviewer", by the editorial board of IEEE Transactions on Automatic Control. IEEE TAC is a top-tier academic journal in the research field of automatic control. Technical Committee on Control Theory, Chinese Association of Autamation (TCCT) held a ceremony on the evening of Sepetember 16, 2014. Professor Yu-Chi Ho of Havard University and Tsinghua University is awarded as te first recipient of the Chen Han-Fu Award. Professor Yu-Chi Ho and his wife, Academian Chen Han-fu and his wife, and Academian Guo Lei attend the ceremony. About the Chen Han-Fu Award: The Chen Han-Fu Award was established by TCCT in early 2014. This award aims to award scholars in the field of scientific and systematic application or control who made an outstanding contribution to the promotion of development of Chinese science and system control theory and application. CFINS student and faculty members got the AIAG Best Paper Award on Supply Chains “Event-Based Optimization for Stochastic Matching EV Charging Load with Uncertain Renewable Energy” by Qilong Huang, Prof. Qing-Shan Jia, Prof. Li Xia, and Prof. Xiaohong Guan at WCICA2014, from June 29 to July2, Shenyang, China. The paper introduces the coordination optimization between uncertain renewable energy and EV charging load. Associate Prof. Qingshan Jia was appointed as as an Associate Editor of IEEE Transactions on Automatic Control to begin on January 1, 2015. Dr. Jia was selected as the 2013 Outstanding Reviewer for IEEE Transactions on Automatic Control. Biao Sun, Yin Zhao, Ning Ding, Qiang Li, Zhe Liu and Jinlong Wang got graduate scholarships this year. Qingshan Jia co-edited the special issue advances in Simulation Optimization and Its Applications in IIE Transactions, which was published in 2013. Their editorial turns out to be one of the three most popular articles of the journal in 2013. 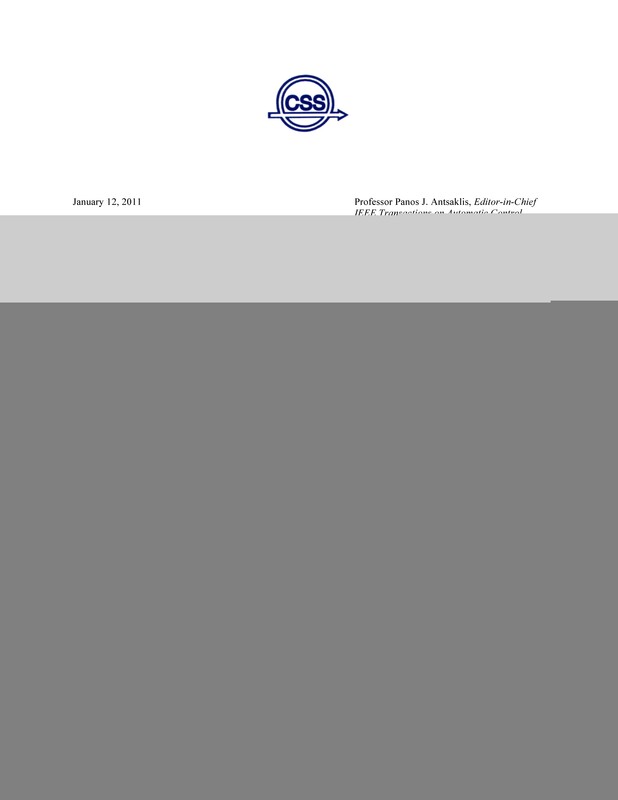 IEEE introduced a new journal recently "IEEE Transactions on Control of Network Systems". Prof. Qianchuan Zhao is inviated to serve as an associate editor for the journal. The website of the journal is open http://sites.bu.edu/tcns/. The paper "System Identification for Output-dependent Bounded Noises and its Application in Learning Personalized Thermal Comfort Model" by Yin Zhao and Qianchuan Zhao was nominated one of the finalists for the Best Automation Paper Award in IEEE ICRA 2013. Dr. Peter Luh, the SNET Professor of Communications and Information Technologies in the Electrical & Computer Engineering Department, has been selected to receive the IEEE RAS Pioneer Award for 2013 "for pioneering contributions to the development of near-optimal and efficient planning, scheduling, and coordination methodologies for manufacturing and power systems." Dr. Luh thinks and speaks using examples and long chains of ideas, and his response when asked to comment on his work with IEEE was no exception to this. He reveals that the international nature of the organization speaks volumes of its mission, saying, "While other engineering disciplines are represented by societies with a national focus, electrical engineering doesn't have an 'American Society of Electrical Engineers.' We have the Institute of Electrical and Electronics Engineers. Our goal is to network the world." Over the course of the past three decades, Dr. Luh has developed and earned an excellent reputation within IEEE. He currently is an IEEE Fellow and has held various leadership positions within the institute's committees. He was also the founding Editor-in-Chief of the IEEE Transactions on Automation Science and Engineering (2003-07) and the Editor-in-Chief of the IEEE Transactions on Robotics and Automation (1999-03). Dr. Luh has a wide range of research interests, which include information technology and mathematical optimization of strategic importance to the society, including: intelligent manufacturing systems; smart and green buildings and eco-communities; smart power systems smart grid, design of auction methods for electricity markets, robust renewable (wind and solar) integration to the grid, electricity load and price forecasting with demand management, and micro grid; and decision-making under uncertain, distributed, or antagonistic environments. He has written and/or contributed to 15 book chapters, more than 100 archival technical journal papers, and more than 270 conference papers on subjects such as power/manufacturing systems, game theory, and large-scale optimization. Dr. Luh was nominated for the Pioneer Award by Dr. Mengchu Zhou of New Jersey Institute of Technology, who is also an IEEE Fellow. "I looked at the list of past [IEEE RAS Pioneer Award] recipients," says Kazem Kazerounian, Interim Dean of the School of Engineering, "and the addition of [Dr. Luh's] name brings recognition and pride to UConn." The IEEE Robotics & Automation Society recognizes the following individuals for their outstanding accomplishments and service to RAS and the robotics and automation community. Prof. Peter B. Luh - University of Connecticut, CT, USA For pioneering contributions to the development of near-optimal and efficient planning, scheduling, and coordination methodologies for manufacturing and power systems. Wireless Sensor Networks Funding Project was assessed as 'excellent'. 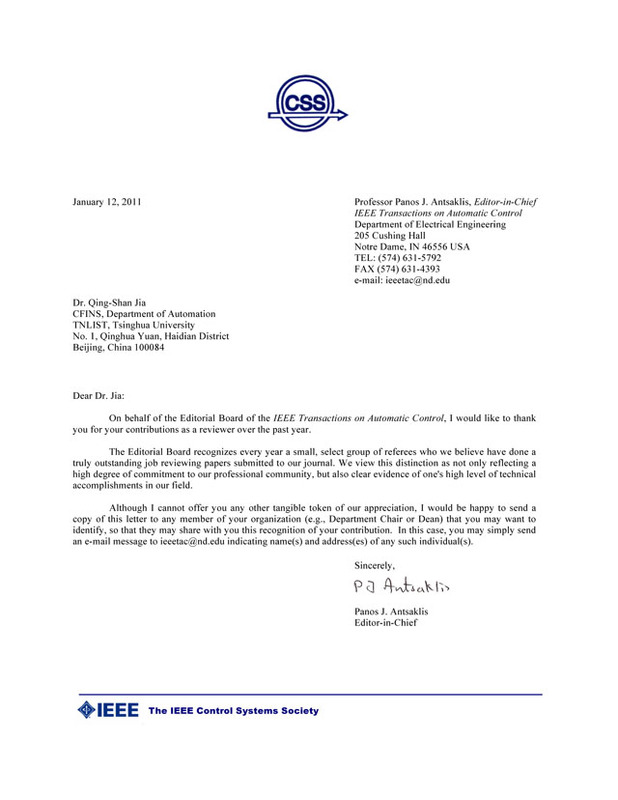 Dr. Jia was selected as the 2010 Outstanding Reviewer for IEEE Transactions on Automatic Control. Congratulation to Prof. Gong, Weibo and his coauthors! 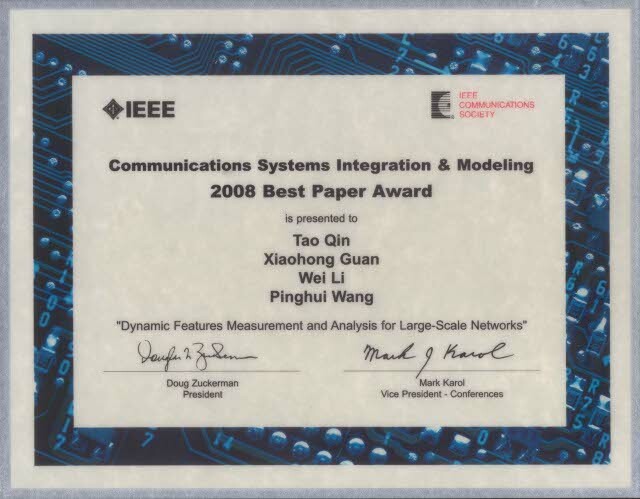 Their paper Sheng Xiao, Weibo Gong, Don Towsley, Secure Wireless Communication with Dynamic Secrets, was selected as one of the three finalists for the best paper award in INFOCOM 2010 among 1535 submissions. In the morning of 11 January 2010, the National Science and Technology Awards Conference held in Beijing. CFINS members, Prof. Xi-Ren Cao, Prof. Qianchuan Zhao, Prof. Xi Chen, and Dr. Qing-Shan Jia, were awarded the second prize of National Natural Science Award, for their excellent research in project "Optimization Theory and Optimization for Discrete Event Dynamic System". Dr. Hai-Feng Wang, the 2009s' graduate from CFINS, won the Tsinghua Outstanding doctoral dissertation prize in 2009, and his tutor is the member of Chair Professors, Prof. Hou-Min Yan. Prof. Qianchuan Zhao won the 2008 Tsinghua New Scholar Award. This award is specially for young faculty members under 40 and there are only 10 awardees. Congratulation to Prof. Shi, Leyuan and her coauthors! Their paper Pi, Liang; Pan, Yunpeng; Shi, Leyuan, Hybrid Nested Partitions and Mathematical Programming Approach and Its Applications, Oct 2008 ,TASE was selected as the IEEE TASE (IEEE Transactions on Automation Science and Engineering) best paper award for the year 2008. Prof.Guan have been selected for membership to the University of Connecticut School of Engineering Academy of Distinguished Engineers. Membership in the Academy is reserved for alumni who have consistently demonstrated consummate professional achievements and success throughout their careers and have advanced the quality and reputation of the School of Engineering. This is an honor accorded only a select few individuals. Prof. Xiao-Hong Guan, who is with the Department of Automation, was appointed as the editor of IEEE Transactions on Power Systems on December 9, 2008, starting 2009. IEEE Transactions on Power Systems is the top academic journal on power systems. It covers the requirements, planning, analysis, reliability, operation, and economics of electric generating, transmission, and distribution systems for general industrial, commercial, public, and domestic consumption. Prof. Guan is the director of Center for Intelligent and Networked Systems (CFINS), Department of Automation, Tsinghua University. He was elevated to IEEE fellow for contributions to optimization of hydrothermal generation scheduling in 2007. Lec. Qing-Shan Jia has got the nomination award of the 100 best Ph.D. theses in 2008. Seethe name list. Congratulation to Prof. Xiao-Hong Guan and his coauthors! Their paper, Tao Qin, Xiaohong Guan, Wei Li, and Pinghui Wang, Dynamic Features Measurement and Analysis for Large-Scale Networks accepted for publication in CAMAD (IEEE International Workshop on Computer-Aided Modeling, Analysis and Design of Communication Links and Networks) 2008 workshop was selected as the CSIM (IEEE Technical Committee on Communication Systems Integration and Modeling belonging to IEEE Communication Society) best conference paper award for 2008. CAMAD 2008 Workshop is associated with ICC (International Conference on Communications) 2008. Lec. Qing-Shan Jia is included in Marquis Who's Who in Science and Engineering, 10th Anniversary Edition, 2008-2009 (http://www.marquiswhoswho.com/products/SCprodinfo.asp). Marquis Who's Who in Science and Engineering offers the most current biographical information of the world's foremost inventors, discoverers, award winners, industry executives, educators, writers, and philosophers whose efforts are advancing human knowledge. The completely updated and expanded 2008-2009 Edition provides key biographical facts on the more than 40,000 men and women leading today's scientific and technological revolution. Prof. Yu-Chi (Larry) Ho, Prof. Qian-Chuan Zhao and Lec. Qing-Shan Jia's monograph Ordinal Optimization: Soft Optimization for Hard Problems has been published by Springer several months ago in 2007. This is the first book that introduces the methodology of Ordinal Optimization. For more details on this book, please follow this link: http://www.springer.com/west/home/generic/search/results?SGWID=4-40109-22-173671324-0. Prof. Xi-Ren Cao's new book Stochastic Learning and Optimization: A Sensitivity-Based Approach has recently been published by Springer. This book covers various disciplines in learning and optimization, including perturbation analysis of discrete-event dynamic systems, Markov decision processes, reinforcement learning, and adaptive control, with a unified framework. This book introduces the recently developed event-based optimization approach, which opens up a research direction in overcoming or alleviating the difficulties due to the curse of dimensionality issue by utilizing the system's special features. For more details on this book, please follow this link: http://www.springer.com/west/home/generic/search/results?SGWID=4-40109-22-173670329-0.